Those Germans who were barring the way at Nijmegen and who subsequently might oppose the ground column between Nijmegen and Arnhem obviously held the key to the outcome of Operation MARKET-GARDEN. Should they continue to deny a crossing of the Waal, the Red Devils near Arnhem might be systematically annihilated. Spearheading the 30 Corps ground column, reconnaissance troops of the Guards Armoured Division linked with Colonel Tucker's 504th Parachute Infantry at Grave at 0820 the morning of D plus 2, 19 September. (See Map IV) Major formations of the British armor were not far behind. From that point priority of objectives within the sector of the 82d Airborne Division shifted unquestionably in the direction of the bridge at Nijmegen. Already at least thirty-three hours behind schedule because of earlier delays south of Eindhoven and at Zon, the ground column had to have a way to get across the Waal. Holding the objectives the 82d Airborne Division already had taken would be facilitated by the artillery and antitank strength that arrived with the ground column. In keeping with this new situation, General Gavin adjusted his units. Part of the 504th Parachute Infantry relieved the battalion of the 508th Parachute Infantry at Hatert and enabled this battalion to reinforce its parent regiment in defending the ridge line near Hotel Berg en Dal. Reducing defensive strength at the Maas bridge near Grave, General Gavin designated one battalion of the 504th as a new division reserve. The former reserve, the 2d Battalion, 505th Parachute Infantry, which had been located in the woods west of Groesbeek, was to drive for the Nijmegen highway bridge. In the meantime, the attack against the south end of the bridge was to begin. To assist the 2d Battalion, 505th, the British provided a company of infantry and a battalion of tanks of the Guards Armoured Division. Artillery of both the Guards Armoured and 82d Airborne Divisions lent support. A small component of this force fought toward the south end of the railroad bridge over the Waal. Men of Company D, 505th Parachute Infantry, commanded by 1st Lt. Oliver B. Carr, Jr., climbed aboard five British tanks and five other armored vehicles and at 1500 struck direct for the bridge through the western fringe of Nijmegen. They moved unopposed until hit by sporadic rifle fire in railroad marshaling yards about a thousand yards south of the railroad bridge. Dismounting, Lieutenant Carr's men continued under cover of fire from the British guns until, at a point less than 500 yards short of the bridge, small arms and 20-mm. fire in serious proportions blazed from a common off the right flank between the station and the railroad bridge. Though the infantry and tanks tried together through the rest of the afternoon, they could make no progress. At last an enemy 88 knocked out the lead British tank. The first attempt to take the railroad bridge had failed. The main attack against the south end of the highway bridge had begun concurrently. Following generally the same route through the eastern fringe of Nijmegen taken the day before by Captain Novak's Company G, the paratroopers, British infantry, and tanks met no resistance at first. Then the story became merely a variation on what had happened to Captain Novak and his men. Approaching within 300 yards of the small traffic circle at the edge of Hunner Park, the force split. One American company and several British tanks veered to the left; the British infantry, the remaining American paratroopers, and the rest of the tanks to the right. At about the same time, the Germans at the traffic circle began to react. Each street radiating from the traffic circle became a deadly field of fire. Bullets and shells interlocked at street intersections. On the left, Company F under Capt. Hubert S. Bass inched toward the park through incessant fire until at last stymied by a log barricade which the British tanks could not pass. On the right, the British infantry, the rest of the tanks, and Company E under 1st Lt. James J. Smith ploughed through deadly fire to come within a hundred yards of the circle. Here an antitank gun knocked out the lead tank. The fire grew more intense. When three more tanks were hit, the remaining armor and the infantry had to pull back. Though they tried other maneuvers through the afternoon—including blasting a path through buildings and advancing from rooftop to rooftop, the paratroopers could not negotiate the last few yards to the traffic circle. Night came. Firing on both sides gradually died down. The fourth try for the south end of the highway bridge had failed. Elsewhere in the 82d Airborne Division's sector, D Plus 2 was "a quieter day. "3 Through most of the day the enemy had nothing in the Reichswald but Corps Feldt's 406th (Landesschuetzen) Division with but four battalions totaling about 500 men combat strength.4 When concentrated against an isolated outpost or in defense of a strong natural position, these Germans nevertheless could make a stiff fight of it. To this men of Company A, 508th Parachute Infantry, could attest after fighting through the afternoon to secure an eminence called Devil's Hill. This was Hill 759, a high point east of Hotel Berg en Dal overlooking the Kleve-Nijmegen highway. In a determined charge covering 200 yards, Company A drove the Germans from the summit, but the enemy recovered on the slopes and counterattacked repeatedly with the support of eight machine guns. By nightfall Company A controlled the hill at a cost of seven wounded and ten killed, but so persistently did the Germans infiltrate during the night that another company had to flush the area the next morning. September, the crossing was set for 1400. In the meantime, in early morning of D plus 3, the 504th Parachute Infantry and two squadrons of tanks from the Guards Armoured Division set out to clear the south bank of the Waal in the vicinity of the designated crossing site. This was near the juncture of the Maas-Waal Canal and the Waal about a mile northwest of the Nijmegen railway bridge. This maneuver was in process and Colonel Vandervoort's battalion had renewed the attack toward the south end of the Nijmegen highway bridge when the Reichswald suddenly developed into something of what it had been supposed to be. The fighting that ensued threatened for a time to upset the scheduled events at Nijmegen. The addition of these heterogeneous troops to those battalions operating under Corps Feldt nevertheless marked a sizable increase in German strength when measured against the five understrength parachute battalions responsible for holding almost twelve miles of front from Nijmegen to Wyler, thence southwest through Groesbeek to Riethorst and Mook. If concentrated adroitly, the Germans might attain a dangerous superiority in numbers, if not in fighting ability. 6th Parachute Division at each village, the Germans attained a marked numerical superiority. At Riethorst close support from ten 75-mm. pack howitzers enabled two platoons of Company B to stall the first German thrust. A second attack in midafternoon, featured by fire from a German tank that riddled American dugouts and machine gun positions, could not be repelled. Eventually the two platoons had to fall back on other positions on the high ground of the Kiekberg, north of the village. Here mortar fire and grenades rolled down the steep slopes helped to turn back every thrust. The fighting for Beek was to continue through most of the next day (D plus 4, 21 September) as the 508th Parachute Infantry sought to regain its positions. At times it looked as if the Germans might push beyond the village onto the high ground at Hotel Berg en Dal, but the paratroopers by nightfall had reoccupied Beek, not to relinquish it again. To provide more time for preparation, H Hour eventually was set back an hour to 1500 (D plus 3, 20 September). At this time the 504th's 3d Battalion under Maj. Julian A. Cook was to cross the river in thirty-three plywood and canvas assault boats from a point near a power plant a mile northwest of the Nijmegen railway bridge. Two squadrons of British tanks, a portion of another battalion of the 504th Parachute Infantry, and approximately 100 American and British artillery pieces were to provide fire support. The artillery was to lay down a fifteen-minute preparation, including a smoke screen on the north bank which was to be filled in where necessary by the tank guns firing white phosphorus. British planes were to bomb and strafe for thirty minutes before H-Hour. As soon as the 3d Battalion had crossed, the 1st Battalion under Major Harrison was to follow. As assault crossing of the Waal would have been fraught with difficulties even had it not been so hastily contrived. Not only is the river wide, but the current is swift, running eight to ten miles an hour. The terrain on the south bank is flat, exposed to observation not only from the opposite bank but from Nijmegen and towering girders of the railroad bridge. Though General Gavin had intended that the boats be loaded from a concealed position within the mouth of the Maas-Waal Canal, the current was so swift that boats launched at this point would have been carried too far downstream. The paratroopers would have to embark on the south bank of the river, east of the canal, in full view of the enemy. Just what strength the Germans had on the north bank of the Waal, no one on the Allied side knew with any assurance. In reality, not long after General Gavin had ordered an assault crossing, Field Marshal Model had directed reinforcement of the SS troops in and north of Nijmegen with "additional forces and all available antitank weapons" sent south from Arnhem. This was to have been accomplished during the night of 19 September in time for a counterattack to be launched at dawn the next day, D plus 3.14 The Germans en route to Nijmegen had to cross the Neder Rijn by the ferry near Huissen, because Colonel Frost's little band of British paratroopers still held the north end of the Arnhem bridge. Just how many "additional forces" arrived by this method was indefinite. In any event, the counterattack scheduled for dawn on D plus 3 never came off. frail little craft. They were nineteen feet in length, of canvas with a reinforced plywood bottom. There were not thirty-three as expected; only twenty-six. To get all the men of the first-wave companies into the boats required dangerous overloading. Three engineers went along in each boat in order to paddle it back to the south bank for another load. Fifteen minutes before H-Hour, the artillery began to pound the north bank. After ten minutes, the artillerymen changed from high explosive shells to white phosphorus, but an erratic wind generally denied an effective smoke screen. As the paratroopers struggled toward the water's edge with the assault craft on their shoulders, the launching site lay naked to German observation. German shellfire began to fall. Allied artillerymen shifted again to ten minutes of high explosive fire. The British tanks churned forward to blast the north bank with overhead fire. Mortars of the parachute regiment began to cough. The assault was on. Almost from the start the crossing of the sprawling Waal was a nightmare. Because the water close to the south bank was shallow, the paratroopers had to wade far into the stream. Sometimes they climbed aboard where the water still was too shallow, then had to debark and push into deeper water. One boat pulled away, leaving a man standing behind, stuck in mud. As the man extricated himself, the current swept him into deep water. The commander of Company H, Capt. Carl W. Kappel, threw off his own heavy equipment, dived into the water to drag the man to safety, then regained his own boat. Once the boats moved into deep water, the strong current seized them. Unfamiliar with the craft and buffeted by the current, the engineers and paratroopers could do little but point the boats toward the far shore and pray that the current would carry them across. At least one boat whirled crazily for a while in a dizzy circle. Any hope of maintaining unit organization upon touching the far shore was quickly dispelled. All the while German fire rained upon the hapless craft. The bullets and shell fragments hitting the water reminded one man of "a school of mackerel on the feed." It was primarily fire from machine guns on the north bank and machine guns and 20-mm. antiaircraft guns on and near the railway bridge, but occasionally artillery fire from the north bank tormented the water. Bullets and shell fragments ripped the thin canvas on the assault boats. Some boats sank. One that was hit by mortar fire capsized only about twenty yards from the north bank, spilling its occupants into the water. Loaded down by an automatic rifle and heavy ammunition, Pvt. Joseph Jedlicka sank to the bottom in about eight feet of water. Holding his breath, he walked ashore without loss of equipment. Almost incredibly, half of the boats made it. Exhausted, dizzy from the circumgyrations, some of the men were vomiting. They had gained the north bank, but only thirteen of the twenty-six boats remained to make the return trip for the next wave. mans with bayonets, knocked out machine guns with hand grenades, and forged a temporary defensive line to await arrival of succeeding waves. Still subject to German fire, engineers with the thirteen remaining assault boats started back to the south bank. Eleven boats made it. Through the course of the afternoon, engineers and paratroopers manning these eleven boats made six crossings of the Waal, bringing first the remainder of Major Cook's 3d Battalion and then Major Harrison's 1st Battalion. The operations on the north bank developed in a series of courageous small-unit actions by squads and individuals belonging to different units. The companies had assigned objectives: Company H, for example, was to bypass an old Dutch fortress, Fort Hofvan Holland, seize the juncture of the railroad and the Nijmegen-Arnhem highway, then drive southeast down the highway to take the north end of the highway bridge. Company I was to defend against enemy counteraction from the northwest and north and, if possible, take the north end of the railway bridge. Yet accomplishment of few of the missions could be attributed to one unit alone. The crossing of the Waal had been a hopper that had scrambled the men almost inextricably. The commander of Company G, for example, discovered in late afternoon that in addition to many of his own men he was commanding much of Company H, a platoon of Company I, and parts of the battalion communications and medical sections. This handicap appeared to work little hardship on these veteran troops. The men saw jobs to be done and tried to do them. A platoon of Company H, scheduled to bypass Fort Hofvan Holland, saw an opportunity to take the fort and silence machine guns and 20-mm. antiaircraft guns that were firing from its towers. Sgt. Leroy Richmond swam underwater to get across a moat surrounding the fort, then signalled [sic] his companions to follow across a narrow causeway. Small groups of both Companies H and I converged on the north end of the railway bridge where they set up BAR's to play fire on the bridge until reinforcements arrived from Company G and the 1st Battalion. Parts of Companies H and I also fought together toward the highway bridge. This vital prize still was intact. In the meantime, in Nijmegen, Colonel Vandervoort's battalion of the 505th Parachute Infantry, augmented by British infantry and tanks, at last had begun to wear down the defenders of the south end of the highway bridge. A tank-infantry assault at 1620 by both British and Americans against the traffic circle south of Hunner Park finally began to produce results. Advancing through and on top of buildings and up fire-raked streets and alleys, the infantry charged. This time they made it. Bolstered by the British tanks, they plunged on almost without pause into Hunner Park. The fight neared an end. The impending success in Nijmegen began to make trouble for the handful of Americans that were raking the north end of the railway bridge with fire, for the Germans began to retreat in wholesale numbers across the railway bridge. Not until the next day was it finally cleared of all enemy. Armament on this bridge alone totaled 34 machine guns, 2 20-mm. antiaircraft guns, and 1 88-mm. dual-purpose gun. bridge, they spotted an American flag floating atop what they took to be the north end of the bridge. This the British assumed to be an American signal that the tanks could cross. In reality, the paratroopers still were a few steps from the highway bridge; the flag was flying from the north end of the railroad span. Spraying shells and machine gun bullets into the girders, the British tankers nevertheless raced onto the bridge. Three tanks reached the far end. Three privates from Companies H and I, 504th Parachute Infantry, got on the north end of the bridge at almost the same moment. The time was 1910. A lot of hard fighting remained before the toehold across the Waal could be deemed secure.15 but as night fell on 20 September the fact was that the daring maneuver to gain the Waal bridges had succeeded. How and why in the light of all the obstacles could be explained only by the resourcefulness and courage of the men who did the job. The cost had been high. During the afternoon, Major Cook's 3d Battalion alone lost 28 men killed, 1 missing, and 78 wounded. Total losses for the two battalions which crossed the Waal and Colonel Vandervoort's battalion in Nijmegen probably were about 200. Yet German losses must have been considerably more severe. On the railway bridge alone the paratroopers subsequently counted 267 German dead. Why the Germans failed to blow either the railway or highway bridge was a matter of some conjecture. Looking at it from the viewpoint of German commanders, the answer lay in German reluctance to admit until too late that these bridges—vital to taking effective countermeasures against the Allied landings—could not be held. Field Marshal Model himself had ordered that neither the bridges over the Waal nor those over the Neder Rijn were to be destroyed. 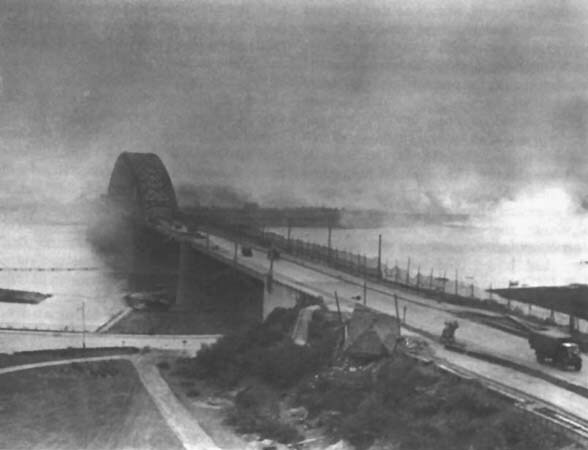 Not until almost midnight on D plus 3, 20 September, after the Allies held the Nijmegen bridges, had Model relented. "It is necessary to hold, and if necessary to blow up the highway bridge at Nijmegen," Model's chief of staff notified General Bittrich, commander of the II Panzer Corps. General Bittrich replied that the word had come too late. For two hours, he said, he had heard nothing from the Nijmegen garrison and assumed that the German units there had been destroyed. 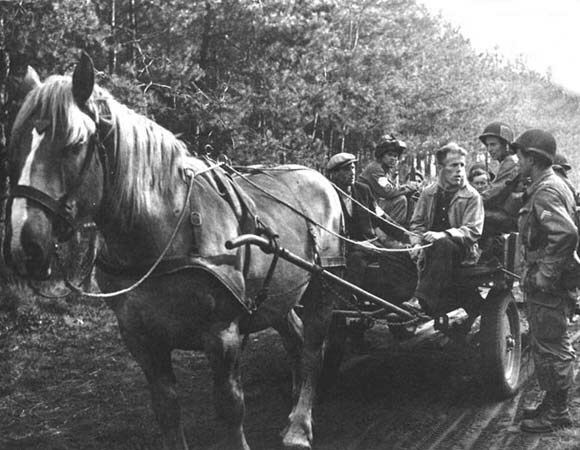 DUTCH FARMER NEAR ZON gives paratroopers a lift to their assembly area. several hours elapsed before sizable British units began to arrive. Indeed, almost another twenty-four hours would elapse after capture of the Nijmegen bridge before the British would renew the drive on Arnhem. British commanders must have been aware of the necessity to get quickly to Arnhem. Although few details on the situation north of the Neder Rijn had emerged, some sketchy information had filtered back during the day through intermittent radio communication with General Urquhart's headquarters. Though garbled by distance and inadequate airborne radio sets, these fragmentary messages had basically confirmed the cursory Dutch communication of two days before. Yet the new details provided no occasion for despair. The report was that Colonel Frost and his little band still held the north end of the Arnhem bridge. Though under constant pressure, the rest of the Red Devils in the perimeter at Oosterbeek still controlled the north end of the Heveadorp ferry. If the ground column could break through quickly, the Red Devils—and possibly the entire MARKET-GARDEN operation—still might be saved. For all the concern that must have existed about getting to Arnhem, only a small part of the British armor was freed late on D plus 4, 21 September, to start the northward drive. As the attack began, British commanders saw every apprehension confirmed. The ground off the main roads was low-lying, soggy bottomland, denying employment of tanks. A few determined enemy bolstered with antitank guns might delay even a large force. Contrary to the information that had been received, Colonel Frost and his men had been driven away from the north end of the Arnhem bridge the afternoon before, so that since the preceding night the bridge had been open to German traffic. At the village of Ressen, less than three miles north of Nijmegen, the Germans had erected an effective screen composed of an SS battalion reinforced with 11 tanks, another infantry battalion, 2 batteries of 88-mm. guns, 20 20-mm. antiaircraft guns, and survivors of earlier fighting at Nijmegen, all operating under General Bittrich's II SS Panzer Corps.20 Arnhem lay seven miles north of this screen. The British could not pass. Only one other possibility did the Allies have for helping the Red Devils at Arnhem on 21 September. By 1400 cloud above air bases in England at last had cleared sufficiently to enable parachutists of the 1st Polish Parachute Brigade to take to the air. Under a new plan, the Poles were to drop close to the village of Driel, near the southern terminus of the Heveadorp ferry. During the night they were to cross the river by ferry in order to strengthen the British perimeter on the north bank until the 30 Corps might break through. Unfortunately, weather over the Continent had not cleared. Of 110 planes, only 53 dropped their loads. Those who jumped included the brigade commander, Maj. Gen. S. Sosabowski, and the equivalent of two weak battalions, a total of 750 men. After overcoming minor opposition on the drop zone, General Sosabowski made the disheartening discovery that but a short while earlier the Germans had driven the British from the north end of the ferry site and sunk the ferry boat. Although General Urquhart radioed that his Red Devils would attack immediately to regain the site, the theory that the weakened, closely confined British could recapture it was, no matter how admirable, wholly chimerical. By now the Red Devils had been confined to a perimeter at Oosterbeek less than half a mile wide and a mile and a half deep. In that perimeter the day (21 September) had brought no brighter developments than it had outside. The Germans the day before had captured the British hospital; the plight of the wounded now was pitiful because of both a dearth of medical supplies and a lack of food and water. The inexorable pounding of enemy guns set the ammunition depot on fire. The only bright spot came in late afternoon when an artillery observation unit at last established firm radio contact with an artillery regiment of 30 Corps. The news to be reported from Colonel Frost and his men at the Arnhem bridge was not good. By daylight of D plus 3, 20 September, the British paratroopers had retained control of only a few buildings near the bridge. During the afternoon of D plus 3 they had been driven by point-blank tank fire from the last of these. Some 140 able-bodied men still had refused to give up, but about 50 of these had fallen during the night. At dawn on D plus 4, 21 September, the order had been given to break into small parties and try to escape. None had made it. For all the adversities north of the Neder Rijn, hope still existed as daylight came on D plus 5, 22 September, that the 43d Infantry Division might break through at Ressen, relieve the British paratroopers, and bring over-all success to Operation MARKET-GARDEN. The 30 Corps commander, General Horrocks, ordered the division "to take all risks to effect relief today." borne Division. Despite an aggressive defense designed to prevent the enemy from concentrating at any one crucial spot to cut Hell's Highway, General Taylor on 22 September was faced with report after report from Dutch sources of large-scale German movements against the narrow corridor from both east and west. At a time when the 30 Corps needed everything possible in order to break through to the Red Devils, severance of the vital lifeline could prove disastrous. The 101st Airborne Division commander, General Taylor, had recognized since late on D plus 2, 19 September, when his command post and the Bailey bridge over the Wilhelmina Canal at Zon had almost fallen to the first strike of the 107th Panzer Brigade, that his division had entered a second and more difficult phase of the fighting. The point was underscored in the morning mist of D plus 3, 20 September, when the 107th Panzer Brigade struck again at the Zon bridge. Though a reinforced battalion of infantry had been disposed to guard the bridge, German tank guns soon controlled the bridge by fire. The bridge might have fallen to the Germans had not ten British tanks belatedly responded to an SOS dating from the crisis of the night before. Knocking out four German tanks, the British forced the enemy back. Recognizing that he had not the strength to maintain a static defense along the 15-mile length of Hell's Highway, General Taylor on D plus 3 chose the alternative. He would keep the Germans surprised and off balance with limited offensive thrusts of his own. Perhaps the most successful of these was a maneuver on D plus 3 by Colonel Kinnard's battalion of the 501st Parachute Infantry. Although Colonel Kinnard had a company outposting the village of Heeswijk, four and a half miles northwest of Veghel, the Germans had infiltrated in some strength along the Willems Canal between Heeswijk and Veghel. Using the bulk of his battalion, Colonel Kinnard drove northwest alongside the canal to sweep these Germans into Heeswijk, where the outpost company played the role of a dust pan. It was a classic maneuver, a little Cannae, which by the end of the day had accounted for about 500 Germans, including 418 prisoners. northwest of St. Oedenrode. This coincided with civilian reports that the Germans were concentrating south of Schijndel for a counterattack upon St. Oedenrode. Impressed by Colonel Kinnard's successful maneuver the day before, Michaelis and the commander of the 501st Parachute Infantry, Colonel Johnson, decided to press the Germans near Schijndel between them. Two battalions of Johnson's regiment were to take Schijndel from the north. Thereupon two of Michaelis' battalions were to attack northward against the German force that was south of the village. In a swift move after dark on D plus 4, Colonel Johnson took Schijndel not long after midnight (21 September). Although a surprise counterattack against the village at dawn delayed start of the second phase of the planned maneuver, Colonel Michaelis' two battalions were able to begin their role by midmorning (D plus 5, 22 September). Progressing smoothly, the attack gave promise of bountiful success. Then, abruptly, at 1430, an urgent message from General Taylor forced a halt. While these four battalions had fought near Schijndel, General Taylor had learned that the Germans were concentrating for a major blow to sever Hell's Highway. During the morning, a drive on Nuenen, southeast of Zon, had revealed that a German column contacted there the day before had gone elsewhere. This coincided with report after report from the Dutch of enemy movements both east and west of the Allied corridor. Indications were that the Germans intended a convergent attack in the vicinity of Veghel and Uden. Lying five miles northeast of Veghel astride Hell's Highway, Uden heretofore had been ignored by the Germans and unoccupied by the Americans. General Taylor had ample reason for concern. A strong convergent attack upon Veghel was, in reality, the German plan. The plan had emerged from orders issued by Field Marshal Model the day before (D plus 4, 21 September).23 While General Bittrich's II SS Panzer Corps and General Meindl's II Parachute Corps stepped up their operations against the British at Arnhem and the Americans at Nijmegen, General Student's First Parachute Army was to sever the Allied corridor farther south. The spot Field Marshal Model chose was Veghel. Pushed back by the British ground attack on D-day and by the subsequent drive of the 12 British Corps, General Reinhard's LXXXVIII Corps now was located west of Veghel and might mount an attack from that direction. On the east the attack was to be mounted by a headquarters new to the fighting, the LXXXVI Corps under General der Infanterie Hans von Obstfelder. This headquarters Model had moved up hurriedly on D plus 1 to assume control of Division Erdmann and the 176th Division in order that General Student might give undivided attention to other units more directly involved against the Allied airborne operation.24 General von Obstfelder now was to assume a more active role. Maltzahn's 107th Panzer Brigade, a small contingent of the 10th SS Panzer Division (Kampfgruppe Heinke) that had earlier been used against the XIX U.S. Corps east of Maastricht, an artillery battalion with three howitzer batteries (105's and 150's), and an infantry battalion of the 180th Division, the last an advance contingent of a replacement division which had been scraped together hurriedly by Wehrkreis X. On the American side, the maneuver near Schijndel during the morning of 22 September was occupying the bulk of Colonel Johnson's 501st Parachute Infantry, but one battalion of that regiment still was in defensive positions in Veghel. Yet not a man was in Uden, the other place which the Americans believed the Germans would strike. To Uden General Taylor turned his attention first. The job of defending Uden General Taylor gave to Colonel Sink's 506th Parachute Infantry, which was becoming available as British ground troops took over farther south around Eindhoven and Zon. Upon first word of the threat, Colonel Sink hurriedly collected about 150 men from a rifle platoon and his regimental headquarters company and rushed them northward by truck. At 1100, 22 September, they reached Uden. Only a few minutes later the Germans appeared. For the remainder of D Plus 5 and into the next day, the men of this little force dashed from house to house in Uden to spread their fire and give an impression of strength. They were fortunate that the Germans were concentrating instead upon Veghel. ther might have found in Veghel only Colonel Ballard's battalion and surprised British truck drivers who were trapped by the cutting of the highway. But upon receipt of Dutch warnings, General Taylor had acted swiftly. In addition to alerting Colonel Sink's 506th Parachute Infantry to move to Uden, he told the commander of the 327th Glider Infantry, Colonel Harper, to release a battalion from defense of the glider landing zone and send it to Veghel. Two battalions of infantry thus were advancing toward Veghel even as the German tanks turned toward the town. Having come into Veghel during the morning to select a new division command post, the 101st Airborne Division's artillery commander, Brig. Gen. Anthony C. McAuliffe, was at hand to co-ordinate the defense. Spotting a 57-mm. antitank gun of the 81st Airborne Antiaircraft Battalion, General McAuliffe yelled to get the gun forward. Divining the urgency of the situation, Colonel Harper meantime had intercepted his glider infantry battalion that was moving over back roads in deference to British priority on the main highway. He directed the battalion commander, Lt. Col. Ray C. Allen, to ignore the ban on travel on the main road. At the same time he told Colonel Allen's motorized antitank platoon to thread through traffic that was coagulating along the highway and race at full speed into Veghel. Almost simultaneously, the 57-mm. antitank gun and the antitank platoon from the 327th Glider Infantry arrived at the northeastern fringe of Veghel. A dispute was to arise later between crews of these guns as to which fired the first shot, but what mattered at the moment was that the first round struck the leading Mark V squarely and set it afire. Faced with what they could not recognize immediately as only a makeshift defense, the other German tankers backed away. The delay thus imposed gave General McAuliffe time to get set. He directed the battalion of the 506th Parachute Infantry into position astride Hell's Highway in the northeast. Colonel Allen's battalion of the 327th Glider Infantry he ordered to defend in the north near a railroad bridge over the Aa River. General McAuliffe requested air support, but unfavorable weather denied any substantial assistance from that quarter. Though the timely arrival of antitank guns had stymied Kampfgruppe Walther temporarily, this was but half of the German strength. Kampfgruppe Huber was even then striking toward Veghel from the west. Because the Americans had taken Schijndel the night before, Major Huber had had to alter his plan of attack. Diverting an infantry battalion as a screen against Schijndel, he had advanced with the rest of his force along back roads and trails to Eerde, thence along a highway to Veghel.27 About 1400 (22 September) Major Huber's tanks and artillery brought fire to bear upon the bridge over the Willems Canal at Veghel. Once again General McAuliffe could thank the fortuitous arrival of fresh troops. General Taylor's order to the 506th Parachute Infantry to move to Uden was paying off, not in the defense of Uden but of Veghel. Even as the Germans took the bridge under fire, another battalion of the 506th Parachute Infantry arrived from the south in company with a squadron of British tanks. Discouraged, Major Huber's tanks and infantry recoiled. If he could not get to Veghel, Major Huber must have reasoned, still he might cut Hell's Highway. Rallying his men quickly, he sideslipped to the south. Advance elements actually had crossed the highway when once again American reinforcements arrived, this time the two remaining battalions of Colonel Harper's 327th Glider Infantry. Using marching fire, the glidermen quickly drove the Germans back. It was Major Huber's attack at 1400 that had prompted the message to Colonel Johnson at Schijndel which in effect ended American attempts to eliminate the Germans south of that village. Although the message directed only that he release a squadron of attached British tanks to move to Veghel, Colonel Johnson did not stop there. Aware that defense of Veghel was his responsibility, he called off the maneuver at Schijndel and directed both his battalions to Veghel. Through the rest of the afternoon of 22 September, German artillery pounded Veghel, and Kampfgruppe Walther launched one strong attack and several probing thrusts. Yet the enemy would have to show greater strength if he were to succeed at Veghel, for General McAuliffe now had in defense of the town a total of eight infantry battalions. These included two battalions of the 506th Parachute Infantry, all of the 501st Parachute Infantry, and all of the 327th Glider Infantry. Some guns of the airborne artillery, some British pieces gathered from the highway, and two squadrons of British tanks also had been included within the perimeter. No matter how sanguine General McAuliffe might be about defending Veghel, the task was not so much holding the village as it was reopening Hell's Highway to the northeast in the direction of Uden. Already trucks, tanks, and supply vehicles so sorely needed at Nijmegen and Arnhem clogged the highway for miles, cruelly exposed to enemy attack along some other portion of the road. General McAuliffe found his impending task eased by the fact that radio communications with the 30 Corps at Nijmegen had remained constant. The 30 Corps commander, General Horrocks, promised to send his 32d Guards Brigade to attack south the next day to assist in opening the road. General McAuliffe also received another assist from the British: during 22 September the 8 British Corps, which was advancing along the right flank of the corridor, had forced two crossings of the Willems Canal to the cast of Eindhoven at Helmond and Asten. Even as Kampfgruppe Walther continued to fight, Colonel Walther had to keep one eye cocked to the southeast. A sudden spurt by the 8 Corps might sever his line of communications. while General Reinhard's LXXXVIII Corps tried to co-operate with a complementary thrust from the west. Unlike Colonel Walther, General Reinhard had no real concern about British advances, for west of the corridor his troops had held the 12 British Corps in the vicinity of Best. Yet because Kampfgruppe Huber had been mauled severely, General Reinhard had to turn elsewhere to find troops with which to attack. During the night he had moved up Colonel von der Heydte's 6th Parachute Regiment, which as a part of Kampfgruppe Chill had fought along the Meuse-Escaut Canal. In order to coordinate with the renewed thrust of Kampfgruppe Walther, Colonel von der Heydte had to, attack immediately after arrival, even though his troops were exhausted from two nights of marching. Moreover, one of the 6th Parachute Regiment's organic battalions had been left behind. In its stead von der Heydte had a battalion of the 2d Parachute Regiment, "a rotten apple," an outfit poorly led and poorly disciplined. To add to the problems, the command situation left something to be desired, As a component of Kampfgruppe Chill, the 6th Parachute Regiment received tactical orders from that source, but the regiment had to depend for supply upon the 59th Division. Faced with these conditions, the colonel understandably had little faith in the prospects of his attack. In the drive against Veghel from the east, Kampfgruppe Walther found the going equally tough. Apparently in recognition of the threat posed by continued advance of the 8 British Corps, Kampfgruppe Walther by noon had begun to fall back. When at 1300 General McAuliffe seized the initiative to send two battalions of the 506th Parachute Infantry to break Kampfgruppe Walther's stranglehold on Hell's Highway between Veghel and Uden, the paratroopers found only a shell of German defenders remaining. They advanced quickly more than a mile to a juncture with the British armor driving southwest from Uden. As soon as tanks and bulldozers could nose damaged vehicles aside, traffic once again rolled on Hell's Highway. Even as fighting continued at Veghel, the 101st Airborne Division's last glider serial was arriving at the glider landing zone. Blessed by genuinely favorable weather for the first time since D Day, this lift on 23 September arrived almost without incident. Included was the 907th Glider Field Artillery Battalion, whose 105-mm. howitzers had been turned back by adverse weather on D plus 2. When the division's seaborne tail arrived during the night of D plus 5 and on D plus 6, General Taylor at last could count his entire division present. In the wake of this reorganization, a renewal of the attack by Colonel von der Heydte's 6th Parachute Regiment near Veghel on 24 September was made under the auspices of the Fifteenth Army rather than the First Parachute Army. Yet the pattern of the action was much the same as the day before. This time the fighting occurred only at Eerde, where a battalion of the 501st Parachute Infantry under Colonel Cassidy fought a courageous, hand-to-hand engagement for possession of local observation advantage in a range of sand dunes near the village. As German success appeared imminent, another battalion under Lt. Col. Julian J. Ewell and a squadron of British tanks arrived. Thereupon Colonel Cassidy counterattacked to drive von der Heydte's paratroopers from the dunes. HELL'S HIGHWAY. Wrecked British supply trucks along the hotly contested route. Heydte's south flank a newly arrived unit, a Battalion Jungwirth. Advancing southeast down a secondary road, Battalion Jungwirth surprisingly found no Americans barring the way. As nightfall neared, the Germans approached the hamlet of Koevering, located astride Hell's Highway a little more than a third of the distance from St. Oedenrode to Veghel and heretofore unoccupied by the Americans. When outposts reported this movement, the commander of the 502d Parachute Infantry at St. Oedenrode sent two companies racing toward Koevering. Arriving minutes ahead of the Germans, these companies denied the village; but they could not prevent Battalion Jungwirth from cutting Hell's Highway a few hundred yards to the northeast. Scarcely more than twenty-four hours after the Allies had reopened the highway between Veghel and Uden, the Germans had cut it again. Through the night airborne and British artillery pounded the point of German penetration in an attempt to prevent reinforcement. The 907th Glider Field Artillery Battalion in firing positions only 400 yards from the Germans laid the guns of one battery for direct fire, operated the others with skeleton crews, and put the rest of the artillerymen in foxholes as riflemen. Yet Colonel von der Heydte still managed to redeploy a portion of his 6th Parachute Regiment to the point of penetration. Marching during the night from Uden in a heavy rain, Colonel Sink's 506th Parachute Infantry attacked at 0830 the next morning (D plus 8, 25 September) to squeeze the Germans from the northeast. A regiment of the 50th British Infantry Division and a reinforced battalion of the 502d Parachute Infantry pressed at the same time from the direction of St. Oedenrode. As the day wore on, Battalion Jungwirth and reinforcements from the 6th Parachute Regiment held firm. By nightfall the Allies had drawn a noose about the Germans on three sides, but a small segment of Hell's Highway still was in German hands. During the night Battalion Jungwirth withdrew in apparent recognition of the tenuous nature of the position. The Germans nevertheless had held the penetration long enough to mine the highway extensively. Not until well into the day of D plus 9, 26 September, did engineers finally clear the road and open Hell's Highway again to traffic. 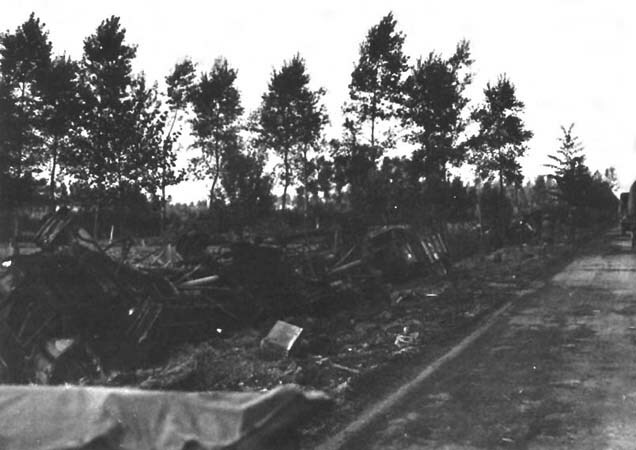 The elimination of this break near Koevering marked the stabilization of the 101st Airborne Division's front. Although the Germans struck time after time in varying strength at various positions along the road, never again were they to cut it. Actually, General Reinhard's LXXXVIII Corps to the west of the highway concentrated primarily upon interfering with Allied movements through artillery fire, and General von Obstfelder's LXXXVI Corps to the cast was too concerned with advance of the 8 British Corps to pay much more attention to Hell's Highway.34 Indeed, by nightfall of 25 September patrols of the 8 Corps had contacted contingents of the 30 Corps at St. Antonis, south of Nijmegen, thereby presaging quick formation of a solid line along the east flank of the corridor. Both General Taylor's 101st Airborne Division and General Gavin's 82d Airborne Division now might hold basically in place while the British tried to make the best of what had been happening at Arnhem. The day the Germans first cut Hell's Highway at Veghel, D Plus 5, 22 September, a new attack by the British ground column to break through to the hard-pressed paratroopers north of the Neder Rijn began auspiciously just after dawn, patrols in armored cars utilized a heavy mist to sneak past the west flank of the German line via Valburg. Taking circuitous back roads and trails, the patrols in a matter of a few hours reached General Sosabowski's Polish troops at Driel, across the river from the British perimeter at Oosterbeek. When the main body of the 43d Infantry Division attacked, the story was different. During the night the Germans had reinforced their defensive screen with a headquarters infantry battalion and a company of Panther tanks.35 After a minor advance to a point well southwest of Elst, still not halfway to Arnhem, the British infantry despaired of breaking through. back roads to the northwest and reached Driel before nightfall. The column included DUKW's loaded with ammunition and supplies for the Red Devils. During the night, the Polish paratroopers were to cross the Neder Rijn in these craft. The need for reinforcement and resupply north of the river grew more urgent by the hour, for on 22 September perhaps the worst weather of the operation had denied air resupply of any kind. Unfortunately, the DUKW's could not make it. Mud along the south bank of the Neder Rijn was too deep. During the night of 22 September, only about fifty Poles riding makeshift rafts managed to cross. The break in the weather on D plus 6, 23 September, permitted a degree of assistance for the Red Devils. Typhoons of the 2d Tactical Air Force and P-47's of the Eighth Air Force struck enemy positions all along the corridor, particularly around the perimeter at Oosterbeek. This was the day when the last serials of the 82d and 101st Airborne Divisions arrived. Upon order of General Browning, the remainder of the 1st Polish Parachute Brigade landed on the secure drop zone of the 82d Airborne Division near Grave instead of at Driel and became a reserve for the American division. Thereupon, the Coldstream Guards Group reverted to the Guards Armoured Division. Now that the British had reached Driel, radio communication with the Red Devils at last was constant. As a consequence, General Horrocks and General Browning no longer anticipated recapture of the Arnhem bridge. At last the hard fact was evident that even should the ground column take the bridge, the Red Devils were too weak to help establish a bridgehead at Arnhem. The two commanders agreed that the best chance of reinforcing or relieving the British airborne troops was through Driel. The 43d Infantry Division therefore concentrated upon strengthening the forces at Driel and upon clearing Elst, in order to open more direct secondary roads to Driel. By nightfall of D plus 6, 23 September, a brigade had fought into the outskirts of Elst, while another brigade had built up about Driel. To Driel went a small number of assault boats for putting the rest of the Polish paratroopers across the river during the night; for General Horrocks still hoped to turn the British perimeter into a secure bridgehead. But the Germans continued to control the north bank of the river, so that during the night only a modicum of ammunition and supplies and some 150 Polish paratroopers got across. For a time, however, General Horrocks refused to give up without at least one more attempt to establish a bridgehead beyond the Neder Rijn. He directed that during the night of D plus 7, 24 September, the rest of the Polish paratroopers be ferried across. Nearby, two companies of the 43d Division's Dorsetshire Regiment were to cross, a first step in projected eventual commitment of the entire 43d Division beyond the river. Once again success hinged on whether sufficient troops could cross the river during the night. Using the limited number of assault boats available, the two companies of the Dorsetshire Regiment paddled over, but daylight came before the Poles could cross. Because of German fire, even the Dorsets failed to assemble in cohesive units on the north bank. Few of them reached the British perimeter. Only about seventy-five of 400 Dorsets to cross over made their way back to the South bank. For a few hours longer, General Horrocks' optimism continued to match Model's apparent pessimism. The British corps commander still wanted one more try at establishing a bridgehead before conceding defeat. Reasoning that he might force a bridgehead elsewhere while the Germans were occupied with the Red Devils at Oosterbeek, he directed the 43d Infantry Division to prepare to cross a few miles to the west at Renkum, where a British armored brigade, driving west and northwest from Valburg, had built up along the south bank of the river. Yet hardly had General Horrocks issued this order when he admitted his plan was illusory. A short while later he rescinded the order. Operation MARKET-GARDEN was almost over. At 0930 on D plus 8, 25 September, General Horrocks and General Browning agreed to withdraw the survivors of the British airborne division from the north bank. the boats, the men inched toward the river. They had to leave their wounded behind. Patient despite nervousness, fatigue, and the cold rain, the men queued for an empty boat. As dawn approached and many remained to be ferried, all who could do so braved the current to swim across. Not all of them made it. As daylight called a halt to the withdrawal, some 300 men remained on the north bank. A few of these hid out to make their way south on subsequent nights, but most probably were captured. Operation MARKET-GARDEN accomplished much of what it had been designed to accomplish. Nevertheless, by the merciless logic of war, MARKET-GARDEN was a failure. The Allies had trained their sights on far-reaching objectives. These they had not attained. On the credit side, MARKET-GARDEN had gained bridgeheads over five major water obstacles, including the formidable Maas and Waal Rivers. The bridgehead beyond the Maas was to prove a decided advantage in February 1945 when the 21 Army Group launched a drive to clear the west bank of the Rhine opposite the Ruhr. The bridgehead beyond the Waal was to pose a constant threat of an Allied thrust northward, through the Germans subsequently lessened the threat by a program of widespread inundation. Operation MARKET-GARDEN also had forged a salient sixty-five miles deep into enemy territory, had liberated many square miles of the Netherlands, and had gained some valuable airfields. It also had drawn some German formations from other sectors of the Western Front and had imposed upon these forces a high rate of attrition. On the debit side, some might maintain that the cardinal point was the failure to precipitate a German collapse. Although the enemy's collapse was hardly a formal objective of the operation, few would deny that many Allied commanders had nurtured the hope. In regard to more immediate and clearly defined objectives, the operation had failed to secure a bridgehead beyond the Neder Rijn, had not effectively turned the north flank of the West Wall, had not cut off the enemy's Fifteenth Army, and had not positioned the 21 Army Group for a drive around the north flank of the Ruhr. The hope of attaining these objectives had prompted the ambition and daring that went into Operation MARKET-GARDEN. Not to have realized them could mean only that the operation had failed. Though MARKET-GARDEN failed in its more far-reaching ramifications, to condemn the entire plan as a mistake is to show no appreciation for imagination and daring in military planning and is to ignore the climate of Allied intelligence reports that existed at the time. While reasons advanced for the failure range from adverse weather (Field Marshal Montgomery) and delay of the British ground column south of Eindhoven (General Brereton) to faulty intelligence (the Germans),42 few criticisms have been leveled at the plan itself. In light of Allied limitations in transport, supplies, and troops for supporting the thrust, in light of General Eisenhower's commitment to a broad-front policy, and in light of the true condition of the German army in the West, perhaps the only real fault of the plan was overambition. Airborne Division's glider infantry regiment and a battalion of the 101st Airborne Division's artillery for four days and helped deny any really substantial contribution after D-Day from tactical aircraft. The major adversities attributable to unfavorable weather might have been avoided had sufficient aircraft been available to transport the entire airborne force on D-Day. Yet to have hoped for that many aircraft at this stage of the war would have been to presume the millennium. As it was, more transport aircraft were employed in Operation MARKET than in any other operation up to that time. In the matter of intelligence, the Allies sinned markedly. In particular, they expected greatest opposition at those points closest to the German front line, that is, near Eindhoven, and failed to detect (or to make adjustments for) the presence of the II SS Panzer Corps near Arnhem, the 59th Division in transit near Tilburg, two SS battalions in the line opposite the 30 Corps, and the proximity of Student's and Model's headquarters to the drop zones. The celerity of German reaction certainly owed much to the presence of Model and Student on the scene, as well as to the blunder of some American officer who went into battle with a copy of the operational order. Faulty intelligence indicating German armor in the Reichswald bore heavily upon General Gavin's disposition of his battalions. Allied intelligence also erred in estimates of the terrain and enemy flak near Arnhem, thereby prompting location of British drop and landing zones far from the primary objective of the Arnhem bridge. Yet all these handicaps possibly could have been overcome had the British ground column been able to advance as rapidly as General Horrocks had hoped. Perhaps the real fault was dependence upon but one road. In any event, the ground troops were delayed for varying amounts of time south of Eindhoven, at the demolished bridge over the Wilhelmina Canal at Zon, and at the Waal bridge in Nijmegen. Had these delays been avoided, the Germans conceivably could not have seriously deterred the advance between the Waal and the Neder Rijn, for this would have put the ground column north of the Waal by D plus 2 at the latest. Not until the night of D plus 3 were the Germans able to use the Arnhem bridge to get tanks and other reinforcements south of the Neder Rijn in order to form the defensive screen that in the end constituted the greatest delay of all. Perhaps the most portentous conclusion to be drawn from the failure of Operation MARKET-GARDEN was the fact that for some time to come there could be no major thrust into the heart of Germany. Combined with the kind of resistance the Americans had been experiencing at Metz and Aachen, MARKET-GARDEN proved that the Germans in the West might be down but they were not out. north. To others, it showed that General Eisenhower had erred in deciding to advance along a broad front, that when committing a strategic reserve a commander should be prepared to support it adequately. Before the two U.S. divisions jumped in Operation MARKET, General Eisenhower had approved their participation with the stipulation that they be released as soon as ground forces could pass the positions they had seized and occupied.44 This had led to an expectation that at least one of the divisions might be released as early as forty-eight hours after the jump. Nevertheless, when the British Red Devils withdrew from north of the Neder Rijn to signal the end of the airborne phase, both American divisions still were in the line. The only real success General Student could report occurred at the Nijmegen bridges over the Waal. On two separate days the Germans struck at the bridges from the air, once with approximately forty planes, and each time scored one hit on the highway bridge. Both hits damaged the bridge but failed to halt traffic. Before daylight on 29 September, German swimmers slipped through the darkness to place submarine charges against buttresses of both the rail and road bridges. For a day neither bridge could be used, though by 1 October engineers had repaired the road bridge to permit one-way traffic and restored it subsequently to full capacity. On 9 October General Browning's British Airborne Corps headquarters took leave of its adopted American divisions to return to England. Already the 1st British Airborne Division and the 1st Polish Parachute Brigade, both so severely battered that their value in the defensive battles was negligible, had left the combat zone. Also by this time headquarters of both the 12 and 30 Corps were in the vicinity of Nijmegen so that any need there for General Browning's command post had passed. By this date, 9 October, the British had widened the waist of the corridor to about twenty-four miles. Thereupon, the 12 Corps assumed responsibility for the "island" between the Waal and the Neder Rijn in order to free the 30 Corps for a projected drive against the Ruhr. Field Marshal Montgomery intended to strike southeast from Nijmegen in order to clear the west bank of the Rhine and the western face of the Ruhr and converge with a renewal of First Army's push against Cologne. This was on 2 October. Yet the days and the weeks and more artillery fire and more patrolling and more British rations and British cigarettes passed, and still the Americans stayed in the line. Even the British rum ration failed to act as a real palliative. To condemn the British for failing to give up the divisions is to show no appreciation of the manpower problems that plagued the 21 Army Group at the time. The British recognized the "accepted principle" that, because of specialist training and equipment and the difficulty of replacing casualties, airborne troops should be relieved as soon as possible from normal ground operations. The British Airborne Corps noted, however, "It is also a fact that they cannot be released until the major tactical or strategical situation allows them to be spared or replaced by other troops. "54 The simple fact was that Field Marshal Montgomery had a lot of jobs to do in light of the number of men he had to do them with. Even before creation of the MARKET-GARDEN salient, the 21 Army Group front had extended from near Ostend on the Channel coast to the boundary with the 12th Army Group near Hasselt, a distance of more than 150 miles. In addition, German garrisons in the Channel ports of Boulogne, Calais, and Dunkerque had to be either annihilated or contained. Upon creation of the MARKET-GARDEN salient, about 130 miles of front had been added to British responsibility, almost double the original length. The need to hold the salient was obvious. It also was a big assignment that occupied most of the Second British Army. Still remaining was a task that General Eisenhower had assigned jointly to the 21 Army Group and the First U.S. Army and had called "the main effort of the present phase of operations. "56 This was the conquest of the Ruhr. The First Army already was preparing to put another corps through the West Wall north of Aachen, seize Aachen, and renew the drive toward the Ruhr. The British shared responsibility for the drive on the Ruhr. To converge with the First Army along the west bank of the Rhine by driving southeast from Nijmegen became the "major task" of the Second British Army. The job would require at least two corps. Yet the emphasis on this task removed none of the Second Army's responsibility for holding the MARKET-GARDEN corridor. There could be no doubt about it: Field Marshal Montgomery needed men. As the fighting went on, figures in the day-by-day journal entries of the 82d and 101st Airborne Divisions continued to rise: D plus 3o, D plus 40, D plus 50. Then, at last, on 11 November, D plus 55, the first units of the 82d Airborne Division began to move out of the line. Two days later, on D plus 57, the last of General Gavin's troops pulled back. Still the ordeal did not end for the 101st Airborne Division. Not until 25 November, 69 days after the first parachutes had blossomed near Zon, did the first troops of General Taylor's division begin to withdraw. Two days later, on 27 November, D plus 71, the last American paratroopers pulled off the dreaded "island" north of the Waal. In withdrawing after relief, the American divisions moved back by truck along the route of their landings. The Dutch people turned out en masse. In Nijmegen, Grave, Veghel, St. Oedenrode, Zon, and Eindhoven, the Dutch set up a roar. "September 17!" the people shouted. "September 17!"